Which 2017 Subaru Outback is Right for You? Subaru's built a name for themselves out of off-road performance. The Subaru Outback fits right into their lineup as a small, fuel-efficient alternative to larger SUVs. There are a wide variety of trim levels, and a couple of different engine options. We break them all down to help you decide which one is best for you. The 2.5i has a starting MSRP of $25,645. It’s equipped with an all-wheel-drive powertrain and a 2.5-liter Subaru Boxer four-cylinder engine that’s capable of 175 horsepower and 174 pound-foot of torque, which is average for a smaller SUV. This engine remains with the Subaru Outback through all four 2.5i trims. While it may not be too powerful, it gets excellent fuel economy of up to 25 mpg in the city and 32 mpg on the highway. 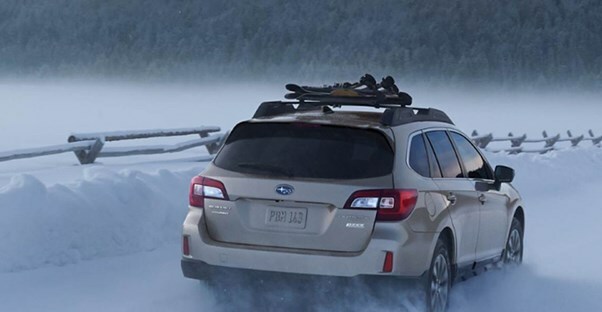 The Subaru Outback 2.5i is designed to carry whatever you need in a variety of locations thanks to the 17-inch wheels and 8.7 inches of ground clearance. It also has roof rails with integrated cross bars to carry equipment or for extra cargo space. Plus, when properly equipped, the Subaru Outback 2.5i can also tow up to 2,700 pounds. The multimedia package is Subaru Starlink, which has a 6.2-inch high-resolution LCD touch-screen with Pandora, iHeartRadio, and other apps. The multimedia system also has an HD radio with iTunes tagging capability, USB ports, Bluetooth, and an auxiliary jack. The system comes with four speakers located around the cabin. Safety includes basic features such as a tire pressure monitoring system, daytime running lights, and a rear vision camera, but this Outback lacks the bells and whistles drivers may find in other brands. To get safety features like lane change assist, customers would have to upgrade to the Limited and Touring levels. The 2.5i Premium starts at $27,695 and brings with it some significant upgrades. The exterior only adds fog lights, but the inside has some small changes that add up to huge improvements in comfort and convenience. The inside adds dual USB ports, dual-zone climate control, and Starlink seven-inch Multimedia Plus. This increases the screen size to seven inches and adds voice-activated controls, Siri eyes-free, SiriusXM, and Travel Link. It also has six speakers, rather than four. Safety improves quite a bit for the 2.5i Premium, with the addition of Starlink Safety and Security connected services. This service has automatic collision notifications, SOS emergency assistance, enhanced roadside assistance, stolen vehicle recovery, and diagnostic, security, and remote service functions. The 2.5i Limited starts at $32,390. This trim starts introducing the luxurious features that bring your Subaru Outback to the next level. Drivers may first notice the leather-trimmed upholstery, heated front and rear seats, power moonroof, and front underguard. The Limited also has an increased wheel size of 18 inches, up from 17. To keep pace with the leather, the rest of the cabin receives some enhancements, as well. These include keyless access with Push Button Start and PIN-code access, an auto-dimming rear-view compass mirror with HomeLink, and a better speaker system. How much better? Harman Kardon better. The 2.5i Limited has 12 Harman Kardon speakers and a 576-watt-equivalent amplifier to help you get the best auditory experience possible, wherever you’re sitting. The 2.5i Limited also improves safety features with the inclusion of standard blind spot detection with lane change assist and rear cross traffic alerts. The Limited trim also has the option to upgrade to a 3.6R, which has a 3.6-liter Subaru Boxer six-cylinder engine. That engine can get up to 256 hp and 247 lb-ft of torque, but drops the fuel economy down to an estimated 20 mpg in the city and 27 mpg on the highway. This stronger engine does not increase towing capacity. In fact, nearly all of the features for the 2.5i and 3.6R Limited are the same. The 2.5i Touring has everything that the Subaru Outback can possibly need for a starting MSRP of $35,995. The exterior of the 2.5i Touring has HID projector headlights, low-profile roof rails, and steering-responsive fog lights. The interior of the 2.5i Touring further adds comfort with the inclusion of a heated steering wheel, heated front and rear seating, and Starlink seven-inch Multimedia Navigation. This trim keeps the Harmon Kardon speakers of the 2.5i Limited, and adds integrated navigation with voice activation. The 2.5i Touring finally rounds out a full suite of safety features with the addition of EyeSight Driver Assist. This package has adaptive cruise control, pre-collision braking, lane departure and sway warning, and lane keep assist functions. The Touring also has high beam assist and reverse automatic braking. Like the Limited, the Touring can upgrade to a stronger 3.6-liter Subaru Boxer V6 engine. It has all the same stats and doesn’t include any extra features. The 3.6R Touring starts at $38,195.